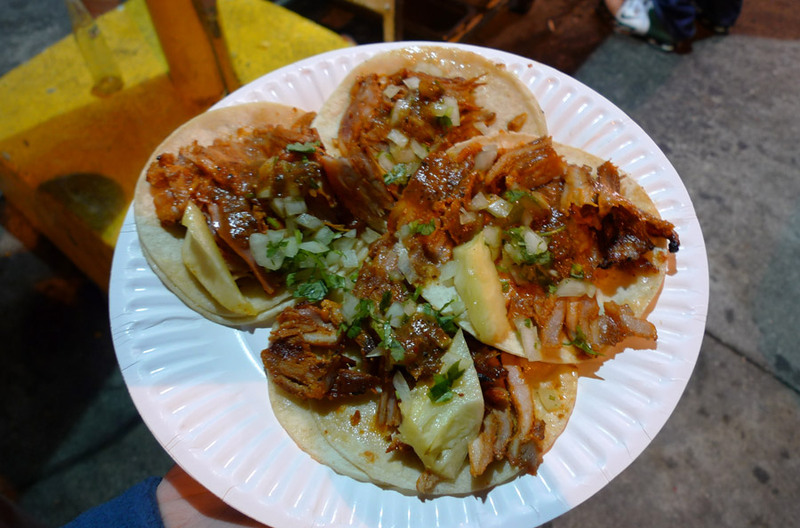 Bandini at The Great Taco Hunt shared with us the fact that the great Tacos Leo had some competition for best al pastor here in the middle part of the city. Carmen and I finally went to Tacos Tamix last night, eager to find out for ourselves. 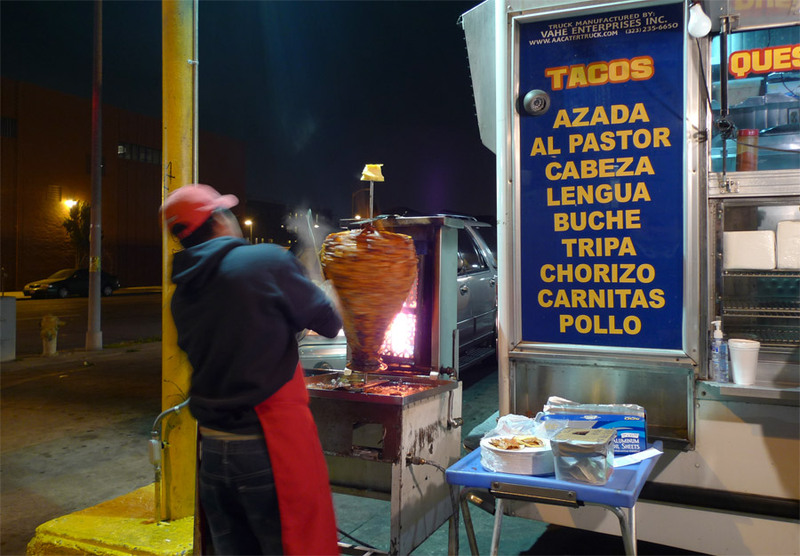 It was Friday night just after 9:00 PM, prime time for eating tacos fresh from the trompo. We had both recalibrated our al pastor meters with a trip to Leo two weeks earlier. Tamix has a great spot, in a car wash (that was actually seeing some use despite the chilly evening) but right next to the sidewalk. 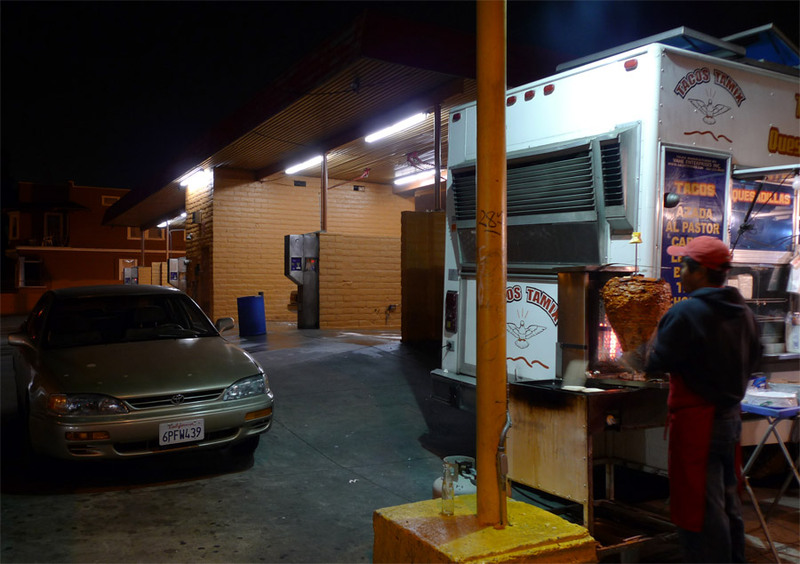 There was a cozy, collegial atmosphere among the taco eaters gathered there, as if Pico Boulevard were somebody’s backyard. I ordered four tacos al pastor, good-sized at $1.00 each. The trompo-master showed us his moves, deftly manipulating the spit and artfully cutting slices of pineapple to be caught mid-air by the taco-mitt. I applied the very spicy red salsa from the condiment table. The meat was sliced thin, more like shavings than chunks of filet. The pineapple chunks were substantial. These tacos were super delicious, as good as Tacos Leo on a normal day, and better than Leo on a bad day (we have found Tacos Leo to be always good, but not consistently at its best). The pork was tender and flavorful, and the sweet toasted pineapple slices completely subdue one’s internal thought conversation with a sense of happy worshipful respect. Tacos Tamix is most worthy. What do you consider good sized tacos? You mentioned that they were only a dollar, but are they a good deal size wise? These tacos are about the same size as those at Tacos Leo, and somewhat above average in size for taco truck tacos, which means that at $1.00 each they are a better deal than taco shop tacos. Four of them makes for satisfaction. All of this is to say, the fine tacos al pastor at Tacos Tamix (or at their competition Tacos Leo) are the best value dollar-for-dollar in food available anywhere in the United States, as far as I know. It’s like an act of robbery to buy these tacos, or maybe it’s more like a gift. Thanks for the info! I’ve noticed that tacos al pastor tend to be smaller as well.